The Canada dollar has a lot riding on NAFTA as Ottawa returns to the bargaining table in a “near-take-it-or-leave-it” squeeze. Like the peso, the loonie jumped Monday as the U.S. and Mexico struck a deal, putting the heat on Ottawa, particularly given President Donald Trump’s renewed threats to hit Canada with tariffs on auto imports should there be no resolution on the North American free-trade agreement. 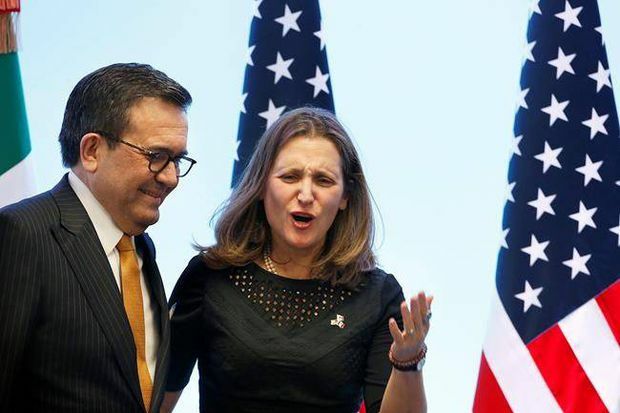 As The Globe and Mail’s Adrian Morrow and Robert Fife report, Foreign Minister Chrystia Freeland will be back at the table in Washington today. “Canada now appears to be in a near-take-it-or-leave-it situation with respect to spinning the U.S.-Mexico deal into a broader agreement on a revamped NAFTA,” said Bank of Montreal senior economist Robert Kavcic. “Should the circumstances dictate that they ‘leave it,’ (Mexico is still openly hoping for Canadian participation), a possible 25-per-cent tariff on auto production looms, as threatened again by President Trump,” he added in a report. Canada is still at risk of being “left out in the cold,” Mr. Rai said, which would, of course, ding the loonie. “That risk increases substantially if the Trudeau government digs in and decides that the new agreement does not suit them,” he said, adding that Ottawa will have to give in on some issues to get a deal. “If Canada is left out – that’s CAD bearish. Full stop,” Mr. Rai said, referring to the loonie by its symbol. Having said that, CIBC, like others, believes a deal with Canada will be struck, even though no one knows what it could look like. “The deal or no-deal play is what matters for Canada and the CAD this week,” Mr. Rai said. Benjamin Reitzes, BMO’s Canadian rates and macro strategist, forecasts that the currency will “appreciate modestly” this year to just shy of 78.5 U.S. cents, and more in 2019 to the 80-mark should Ottawa join the U.S. and Mexico in a new agreement. This comes, too, at an interesting time for the Bank of Canada, which meets next week and had been expected to hold its benchmark rate steady until October. Governor Stephen Poloz and his central bank colleagues have oft cited the uncertainty surrounding NAFTA, but have also said they’re waiting for something concrete. “Until there is a more definitive result on NAFTA, expect the status quo from the BoC on policy,” Mr. Reitzes said, and, thus, he still expects the central bank to hold the line next week. “Note that even if Canada joins the agreement, it’s unclear the BoC will get more aggressive on policy, though it likely would ultimately mean that interest rates finish the cycle higher than if there is no NAFTA resolution,” he added. Tell me, have you ever heard the phrase ‘divide and conquer’? Bank of Nova Scotia raised its dividend as it posted a dip in third-quarter profit, breaking from the pattern set by other major Canadian banks that have reported stronger results so far. Profit slipped to $1.9-billion, or $1.55 a share, from $2.1-billion or $1.66 a year earlier. On an adjusted basis, profit rose to $2.25-billion, or $1.76, from $2.12-billion or $1.68. Return on equity came in at 13.1 per cent, compared to 14.8 per cent. The bank raised its quarterly dividend by 3 cents to 85 cents. BMO, meanwhile, posted a jump in profit, and to this point is the sole bank not to raise its dividend. BMO profit rose in the third quarter to $1.54-billion, or $2.31 a share, with adjusted profit climbing to $1.57-billion or $2.36. Return on equity was 14.7 per cent, compared to 13.4 per cent. Lisa Kramer: Is the push toward zero-fee funds a race to the bottom?